Dolly Varden (Salvelinus malma Walbaum) are locally abundant in all coastal waters of Alaska. Both anadromous and freshwater resident varieties exist with lake, river, and dwarf populations being found among the freshwater residents. Dolly Varden are one of Alaska’s most important and sought-after sport fish. The fish is unique, as it is the only member of the family Salmonidae, excluding salmon, that has readily adapted to the numerous small- to medium-size nonlake streams that enter our saltwater areas. As the mature fish return to their home stream to spawn and feed in August and September, most coastal streams in Alaska provide good fishing for Dolly Varden. The fish begin entering lakes in late August and are in prime condition after their spring and summer growing season. A sea-run Dolly Varden caught on a fly rod will produce a fight not easily forgotten. 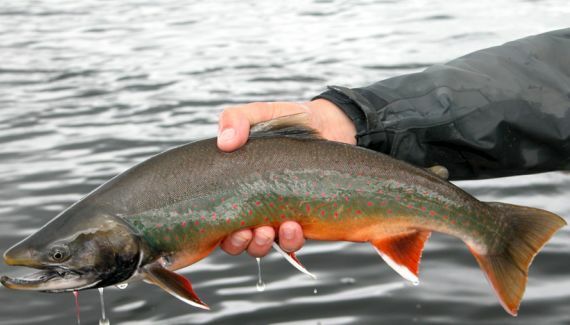 Both freshwater and sea run Dolly Varden are abundant in many of the lakes and rivers we fish. The Dolly Vardon is one of the most stunning looking fish in all of Alaska! And at the RCL, we are lucky to have several remote fisheries to target these wonderful fish. We often experience high catch rates while dolly fishing. This combined with the brilliant coloration and even large size at times, makes our fisheries a ”world class” experience. The dolly vardon is well and truly an opportunistic feeder. They are so accommodating in fact, they often eat your bright colored indicator! Some guides fish a crazy “indicator fly” to be able to hook some of these slightly frustrating strikes. Realistically, they can be caught using many different methods. On the rare occasion they will even eat dry flies waked or dead drifted! In general dollies run a little smaller than the trout and char, but one of our river systems has huge dollies with the average size being over 18 inches and top out at 28 inches. Another added bonus to dolly fishing is the tiny streams in which we fish for them. Sight fishing is always a fun way to spend a day up a beautiful remote valley. The gin clear waters of Alaska, allows this to consistently be a major part of how we choose to fish all of Alaska’s resident fish. Our specialized guides will not only enthusiastically stalk your next fish. They are happy to teach you to be a better fish spotter too. Come to our Alaska fishing lodge and enjoy some of the best Dolly Varden fishing in Alaska!